Over the last few years, we have seen mobile device sales explode and PC sales stagnate. While there have been plenty of opinions as to the reason for this shift, there has been very little research to explore the impact of this “Post PC revolution”. Let’s take a look at how smart mobile devices, led by iOS & Android, have affected the PC market. The chart shows that while the PC install base has been steadily rising over the past five years, PC shipments have stagnated. 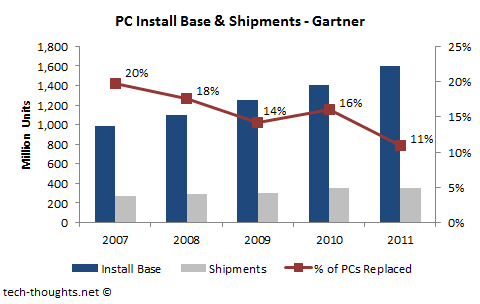 Therefore, the percentage of PCs replaced has steadily dropped over this time frame. It is interesting to note that the only year in which this figure rose was in 2010, but this was most likely caused by a “low base effect” because of unexpectedly weak macro-economic conditions in 2009. The inverse of “% of PCs Replaced” in the chart above should give us an indication of the PC replacement cycle for that year. Now, let’s take a look at mobile device shipments over the same time frame. In my previous post comparing the smartphone and tablet markets, I had made a distinction between “legacy” smartphone platforms and “modern” smartphone platforms. So let's compare shipments of “modern” smartphone devices & tablets (put together, let’s call them "modern mobile devices") to the PC replacement cycle. Smartphones shipment figures are from Gartner, while tablet shipment figures are from IDC. 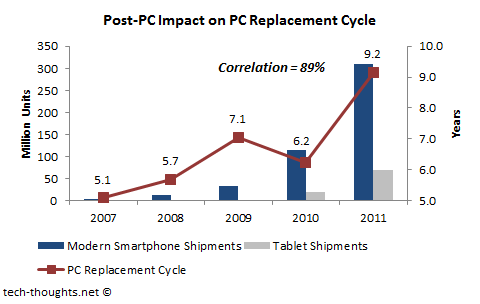 From the chart above, we can see that modern mobile device shipments together exhibit an 89% correlation with the PC replacement cycle for a given year. This means that as mobile device shipments have grown, consumers have resisted upgrading their PCs more and more. However, this still does not prove that there is a causal relationship between the two. 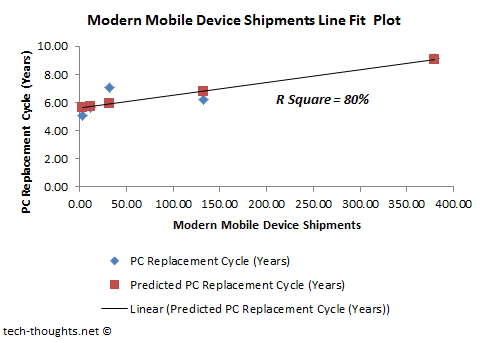 The regression output shows an R Square of 80% which means that 80% of the variation in the PC Replacement Cycle can be explained purely by the rise of modern mobile device shipments. The analysis shows an F-Significance & P-value of about 4% and implies that this output has a confidence level of about 96%. These outputs imply an unexpectedly strong relationship between the two variables, given the fact that we have only five data points. This clearly proves that consumers have held off replacing their PCs because they purchased mobile devices instead. Since PC penetration is incredibly high, this trend, if it continues, would lead to sharply dropping PC sales. It is interesting to note that this impact has mostly manifested itself in developing economies. However, as smartphone & tablet prices continue to drop, rising emerging market penetration should give us the same outcome, intensifying the global impact of this shift. Apart from the fact that iOS and Android based mobile devices generally hold more appeal to consumers, there is a much larger reason driving the sustainability of this shift. Over the last couple of years, it has become more and more apparent that PCs are seen as appliances, in that owning a PC is a necessity, but upgrading one is not. This has been driven by a shift in development activity from the traditional PC platform to mobile devices and the web/mobile web. When was the last time one of us had to upgrade a PC in order to run a new application? The only industry that still focuses on the PC consumer market is the PC gaming industry, and based on recent comments, even they have begun to diversify onto other platforms. 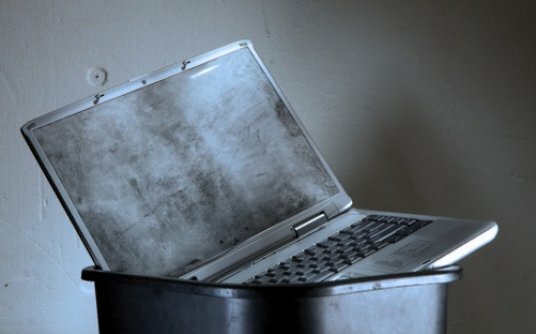 Intel attempted to bring the “cool factor” back to PCs by launching the “Ultrabook” but failed miserably because it did nothing to drive developer interest and the high prices did nothing to drive consumer interest. In fact, the only reason PC sales have even stayed afloat is because they are seen as “content creation” devices while mobile devices are seen as “content consumption” devices. This is true today is because PCs already have numerous, legacy content creation tools built for them, while developers have focused on building content consumption tools for smartphones and especially tablets. There is no reason why content creation tools cannot be built for these devices, and given the trend in developer interest, that should happen as global tablet penetration increases. 1) Developer Interest - Windows 8 does nothing to spur developer interest in traditional PCs (defined as any x86 based PC or tablet). In fact, Microsoft seems to have gone out of their way to make developers focus on Windows 8 apps that will work across both x86 and ARM based devices/tablets. 2) Touch-optimized apps on non-touch devices - Windows 8 apps would mostly be touch optimized and are unlikely to be used by average, traditional PC users on non-touch devices. As an example, let’s take a look at Apple’s experience. Since the Mac is more of a niche product, average Mac users tend to be more sophisticated than average PC users and we can assume higher app usage. However, the Mac Appstore totalled only about a 100 million downloads last year (with an install base of nearly 60 million), while iOS users download about half of that number every single day (with an install base that is roughly double that of the Mac). Based on this and the Windows' upgrade cycle, it is fairly safe to say that Windows 8 apps will not find much traction among traditional PC users. 3) Too Expensive - Microsoft’s vision for Windows 8 devices was seen when they unveiled the Surface. Unfortunately, much like Ultrabooks, touch based Windows 8 x86-based PCs & hybrids would have a very high BOM and hence, would be too expensive to spur widespread consumer adoption. 4) UI Shock – The biggest difference between Windows 8 and previous versions of Windows is that the UI (now renamed Modern UI) is drastically different. This UI shock is likely freeze the broader market, which will make the already extended PC replacement cycle even longer. Microsoft seems poised to make this problem worse by limiting the downgrade option (from Windows 8 to Windows 7) to Windows 8 Pro and not the basic version of Windows 8. It is a well-known fact that most PC buyers stick to the basic version of Windows, while power users & small enterprise customers consider buying the more expensive Pro version. This could cause consumers to delay purchases even further or purchase Macs instead. 5) Supply Chain Indications - Finally, supply chain indications support my conclusion that PC sales will remain weak (and possibly get even weaker) following the launch of Windows 8. Intel recently downgraded their Q3 outlook by stating that OEMs were cutting chip inventory ahead of the Windows 8 release. If PC makers expected an uptick in sales after Windows 8’s launch in Q4, they would be stocking up on inventory and not cutting it. Based on this, it is safe to say that Windows 8 will be no savior for the PC industry. Conclusion – PC sales have been stagnant over the last couple of years because consumers have focused on buying mobile devices instead. During this time frame, PC upgrades have become less necessary because developer activity has stagnated on the PC platform. The upcoming launch of Windows 8 will deteriorate the PC market even further as it as it introduces certain point-of-sale challenges, while doing nothing to correct the problems plaguing the industry. In the what they would call performance range Intel hasn't released anything with more than 4 cores and that hurts the enthusiasts market where many would be more than happy to upgrade if they had a 6-8 cores option at 300$ but Intel got greedy. I guess the time spent on PCs dropped a lot and should be mentioned since it lowers the value of the device to the consumer,a factor that should impact both unit sales and ASP. I also got a semantics problem,all are PCs just different form factors (from the desktop to Google Glass),some companies are failing to adapt and they'll be the next Kodak but PC sales are booming just lower ASP and a lot more players involved. That's just the point. PC penetration is so high that the enthusiasts market makes up an incredibly small proportion of the total market. Even if enthusiasts replaced their PC every year, I doubt that would have much of an effect on the overall market numbers. However, I agree with your point on lower time spent on PCs. Regarding the semantics, I agree that the traditional definition of the PC was any personal computing device (including smartphones, tablets, wearable devices, etc.). However, since the mobile revolution began, the definition (at least in industry circles) began to change to x86-based PCs & Tablets. That's the definition I've been using, because at the end of the day, it affects companies that focus on that particular product segment. Great points Chris! Based on your feedback, I'd have to agree that the regression results are questionable. The great thing about Tech-Thoughts is that it also allows me to learn from my readers. The point I was trying to make is that there are very few factors which can have such an impact on the PC Replacement cycle. The only other major factor would be the macroeconomic environment and I think we can all agree that the situation in 2011 is far better than the one in 2009. Even the Windows 7 launch in 2009 hasn't seemed to have much of an impact. PC replacement has been slow primarily because, since Windows XP, there have been only incremental improvements in the PC user experience. If your PC still works and you're installing all your updates, you can use your PC until it irreparably dies of hardware failure. Though prices have flattened, there's no compelling reason (no new, improved experience) to upgrade. You blamed this on developer focus, but I'd blame human sensory perception thresholds given current technology. In the meantime, mobile devices have sold because they solved nagging limitations of laptops (greater battery life and reduced weight), albeit at some sacrifice of functionality. So PC replacement cycle slowed not because developer focus shifted, but because PCs hit the limit of what could be accomplished within that form factor, given the state of interrelated technologies, and solving the next stage of problems (battery life, weight) had to be done through a new form factor. Touch screens were also a significant leap as the first mass solution that's allowed us to transcend the keyboard. Check the history, Bill Gates has been aching to transcend keyboards via a voice-interface for decades and invested lots, but nothing proved sufficiently effective to grab consumer loyalty. Microsoft also introduced tablet devices, albeit requiring a stylus. Rather ironic that, while Apple was first to market the GUI, but Microsoft took it to the masses with Windows, Microsoft was actually first to introduce tablets, but Apple's timing was better in pulling together all the relevant technologies to deliver a truly compelling user experience with iPod and iPhone before porting it to the iPad. Smartphones and tablets are going to hit saturation too, and probably faster than you'd think. And more because they will reach another physical limit of the human sensory perception threshold, or the radio bandwidth constraints, or will just become so pervasive as to lose all status symbol value (which frankly is what still drives a lot of iPhone lust). Meanwhile Microsoft is actually focusing on integrating user identity via cloud services (Skydrive, Xbox Live, etc.) to support the full range of devices (smartphone - tablet - PC - home entertainment console), delivering YOUR stuff wherever YOU are on whatever device YOU happen to be using. The questions are, will people appreciate Microsoft's ever-present, device independent services, or are they going to continue to fixate on the piece of hardware they happen to have in front of them? and will Microsoft's online services achieve the app & content richness of iTunes and Google Marketplace? If nothing else, corporate purchases of Windows 8 should soon drive critical mass of customers that will finally attract developers to create Windows phone/tablet/PC apps. And then we'll truly have a horserace. 1. Interesting theory, but the data doesn't support it. The replacement cycle's been stretched and peaked in 2011, which indicates no relationship to XP. 2. If mobile devices hit " saturation" quickly, that means adoption has to grow incredibly quick. You can't have saturation when Penetration's still low. 3. There is no data that shows corporates having any interest in windows 8. There is sufficient data to the contrary. The PC sales randomly going down because of ios and android devices. It offers more than a PC now a time. So every one goes to those.